Business Process Modeling (BPM) has been for a number of years in the spotlight of research and practice, aiming at providing organizations with conceptual modeling-based representations of the flow of activities that generate its main products and services. It is essential that such flow of activities is engineered in a way to satisfy the organization’s goals. However, the work on BPM still makes shy use of goal modeling and the relation between goals and processes is often neglected. In this paper, we propose a method that supports the analyst in identifying which activities in a business process satisfy the organization’s goals. Moreover, our method allows reasoning regarding the impact of each of these activities in the satisfaction of the strategic (i.e. top) goals of the organization. The results of this analysis may lead to reengineering, and grant the analyst with the means to design higher quality BPMs. 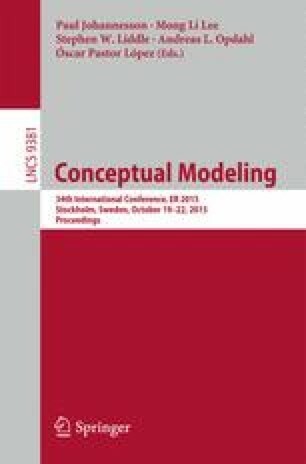 Besides describing the method, this paper presents a preliminary evaluation of the method by the means of an empirical study made in a controlled environment. This work is partially supported by CAPES/CNPq (grant number 402991/2012-5) and CNPq (grant numbers 461777/2014-2 and 485368/2013-7). The authors are also grateful to Giancarlo Guizzardi, João Paulo Andrade Almeida and Mateus C. Barcellos Costa for the fruitful discussion regarding the proposed method.